As many of you know our regularly scheduled Fall 2018 meeting had to be delayed due to the many running changes in the Compostela enclosure design, which resulted in them not being completed in time. This, in turn, led to scheduling problems for many of the members who live far from Atlanta. After one aborted attempt we were all finally available to meet on Saturday, April 13, 2019. We know that many of you have been looking forward to our review of the new “Altec Lansing” Compostela loudspeaker system, and apologize for delay. What would become the Compostela began a few years during a phone call between Bill Hanuschak of Great Plains Audio and Steve Freeman of Vintage Speaker Revival. A subsequent call a few days later included Jeff Peace of the North Georgia Audio Society. The idea was to develop some new loudspeaker systems using vintage Altec Lansing horns and drivers. Jeff felt that any new design would require super tweeters, but Bill informed him that Altec never made any decent ones. So the search began for a super tweeter to use with the new design. Several ideas were passed around and eventually it was decided that two new systems would be designed: Compostela and Lansing 300. The Compostela would be a D’Appolito hybrid and the Lansing 300 a traditional 3-way with a 15″ woofer. When design began, Richard Christianson and Greg Montfort were brought on as technical advisors to the project. 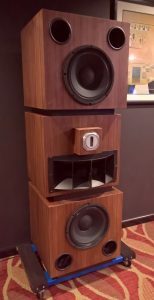 The look of the new cabinet needed to be pure Altec Lansing, so the cabinets were modeled after the stacked box design of the Model 19 and 14. There was much discussion about whether to use 416 or 515 woofers, but in the end the 414 was chosen because it worked better with the narrow profile of the cabinet. The Beyma CP21/F slot tweeter was chosen after evaluating a dozen or super tweeters because it blended almost magically with the 811B horn. The second listening session began with “Cuentame Que Te Paso” from Putumays Presents Afro-Latin Party. The majority of this session was spent listening to Latin music with the occasional modern country music track. Remarks centered around the realism of the percussion instruments such as “It’s like the band is right there in front of me.” It should also be noted that this group listened at higher than normal listening levels. They really got into the dynamics and transients the Compostelas easily reproduced. The third session was a small group that included Steve Freeman and Greg Montfort. Greg decided right away that he didn’t like the toe-in angle, the speakers were moved until he felt the angle was just right. This was a lengthy listening session that ended with several plays of Christian McBride’s “Night Train from his CD Gettin’ to It. In the end there was notable disagreement between Greg and Steve. Greg felt that the Compostela lacked the dynamics of the big horn Voice of the Theatre system. Steve, on the other hand, felt they were an overall improvement because they offered the same “big sound” but were more controlled and detailed. The fourth and final group was large and the session lasted about five hours. Before the listening tests had even begun Scott said that he doubted it could be a very good system because the 811B horn is too harsh. Others brought up the possibility of driver alignment problems, and questioned the choice of the 414 woofers. This was clearly the toughest crowd to please. 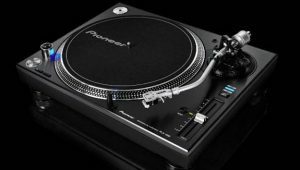 The Pioneer PLX-1000 is a professional turntable designed primarily for DJ’s, but could it be a great home audio device? Pax Innovation restores a lot of vintage turntables, many of them rare and very expensive, so when they started talking about the PLX-1000 it immediately caught our attention. At first glance the PLX-1000 looks like just another clone of the Technics SL-1200 Mk II, but that’s where the similarities end. Its resin base causes it to weigh 32.19 lbs. Everything is well damped, even the underside of the platter has damping material applied to it. The adjustable feet make it easy to level. It starts up almost instantly and breaks to a quick stop. It uses a standard three pin IEC connector so you can easily connect a power cord of custom length. It has female RCA connectors on the rear allowing you to choose your own cables, or use those included with it. You also get both a slip and rubber mat for the platter. During setup we noticed a couple of issues. The first was how the user manual described mounting the cartridge. We tried it and then measured with a protractor. It was incorrect. So we recommend that you use a protractor and ignore the instructions. The next issue we encountered was the anti-skate adjustment. When set to 1.75, which is what the tracking force of our cartridge would call for, it skated badly. We ended up setting it with an oscilloscope to 4.25. Due to this we recommend you disregard the anti-skate scale and perform this manually with a test record or scope. The tracking force scale was as good as any Japanese S arm, but we weighed it on a stylus scale for accuracy. First, our only complaint about the PLX-1000: the dust cover doesn’t have hinges! Yes, the PLX-1000 is that good, and it can be easily purchased for $699 with free shipping any day. It’s so good that a few Thorens and Linn units will be available in the near future. Check back for part II of the discussions from the event.